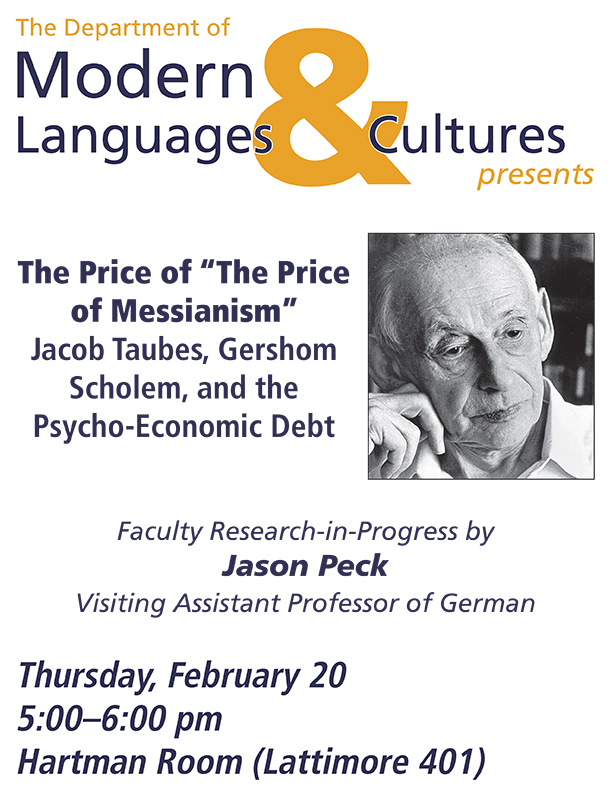 In his essay “The Price of Messianism,” the post-war German Jewish intellectual Jacob Taubes critiques the influential thesis put forth by Gershon Scholem in his book The Messianic Idea in Judaism that messianic movements mark an “inward” direction in Judaism. This inward movement of messianism deprives Judaism of an outward, historical focus and enacts a “psycho-economic” debt (Taubes) within Judaism itself. Taubes, however, argues that rather than a life lived “in deferment” (as Scholem would argue), messianic movements in Judaism represent a “jump into history.” Indeed, for Taubes, “[e]very attempt to bring about redemption on the level of history without a transfiguration of the messianic idea leads straight into the abyss. Yet, in my talk, I would like to return to Taubes’s notion of the “psycho-economic” price paid by the messianic. In order to “pay a price” there is an economically and theologically redemptive relationship that requires a real and imagined debt for its existence. For Scholem, this debt results in the “endless powerlessness” of the Jewish people, which leaves them impoverished on “the plane of world history” (emphasis mine). Taubes does not see the Messianic ideal leading Jews to “a life lived in deferment” (in Scholem’s words) but sees, with the Messianic ideal, an attempt to arrest this deferment and cancel the debt. Prior to the talk, attendees are welcome to peruse Professor Peck’s paper, which can be found here. Sponsored by the Department of Modern Languages and Cultures.